Hands down one of our favourite reads of 2016. No word of a lie, one of our favourite anti-heroes of all time. Yes, this book just grabbed us and didn’t let go till we’d read the last page. 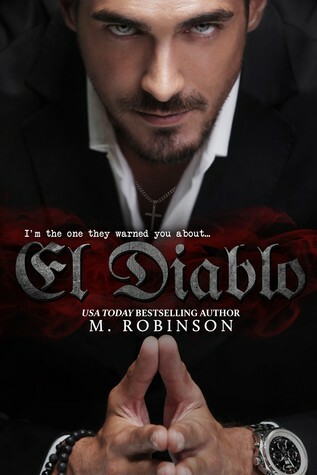 Without question El Diablo is our favourite book to date by M. Robinson. Wow…just wow it had us consumed and we have to applaud M Robinson for staying true to her characters and never sacrificing the story or their natural journey. For never giving anything away. For surprising us. We loved that Alejandro’s story -because for us it truly was his story- started from an early age and took us right up to a mature older age- so decades. We felt we lived his dark, gritty and raw story alongside him. El Diablo- yes, he sure was, in so many respects. He really worked hard to gain our affection and understanding because cold and hard doesn’t even come close. But this talented Author placed some very clever and brilliant moments of transparency where you saw a side of him which you needed to see in order to fully understand the man beneath the role he was groomed to fill. A boy and young man who loved his Mum and sister with all his heart and then some. A man who never fails to try to protect those he cares about. A man who tries his all to keep people at an arm’s length in fear of them getting caught in a deadly crossfire. A man who truly just needs someone by his side loving him and loving El Diablo in equal measure. So much tragedy, hate, despair and violence. Seriously, how many times could our hearts break in one story? Not only that, how many times would they break over one man and his love? Captivatingly visual story of Crime family’s loyalties, expectations and tragic consequences. Sweet, sassy, strong, vulnerable- child victim of life, Lexi. The beautiful ballerina. She came into a story that had taken many paths only to play a momentous and powerful role. The girl, the teenager then the woman. She was a force. If words and actions could maim; her body would be marked by uncountable scarring. We had no idea where this story was taking us, sure we had an inkling to some but we were surprised, and we LOVE being surprised. The writing was stellar- the story fabulous. We cannot recommend El Diablo highly enough as it was a passionate tearjerker that stole our hearts and minds. We fell in love with The Devil. This book was totally amazing… I loved everything about it, I cried when he got shot I couldn’t read on, my heart broke “literally” but I did and I was just going crazy with happiness…. Lexi loved him longer than she was alive… I fell in love with the devil that day… I didn’t want the story to end.. Congratulations on a perfect book Mr. Robinson..